Spring is one of the best seasons for seeding your lawn, because of the mild weather and excess moisture. Planting your own grass seed is less expensive then sodding but takes more preparation and patience to wait for the seeds to germinate. The key to seeding your lawn in the spring is to protect the seed after planting it. Use a rake to loosen up the top 2 inches of the soil on your lawn. During this time, discard any rocks or dirt clods that would get in the way of grass seed growing. Apply a generous layer of topsoil to the ground (about 1 inch), along with a starter fertilizer, if desired. Use your hands to sprinkle the grass seed on top of the topsoil. Rake over the yard lightly after planting the seed to integrate it evenly into the soil. Layer peat moss over the grass seed about 1/2 inch thick. This protects the seed from foraging birds or animals, and strong winds. Water the seed immediately after layering with peat moss. The water needs to penetrate into the ground at least 6 inches (about 20 minutes). Break up the watering time to discourage puddles by watering for about 10 minutes, letting the water soak in for about five minutes, then watering for an additional 10 minutes. Do this watering process each day for 1 1/2 to 2 weeks. If you live in a rainy environment, you can water the grass seed less often. Reduce to watering every three days when the grass reaches about 1 inch in height. 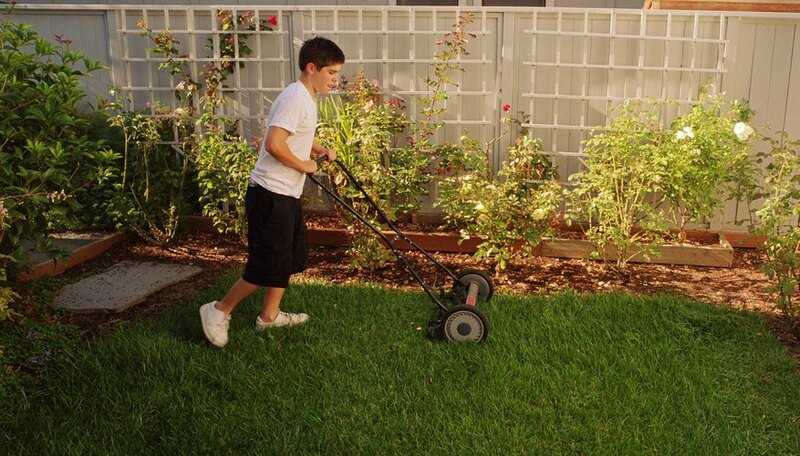 Apply fertilizer to your lawn around six weeks after the grass seed sprouts. The type of fertilizer you choose all depends on your grass variety, region and climate, so follow the directions on the fertilizer carefully.